Unfortunately we were only able to capture half of the conference opening keynote. Tracy is the Senior Partner Success Manager at Salesforce.org. They are a CRM strategy and organizational technology leadership expert, having previously co-founded a Salesforce implementation firm and consulted on Salesforce for nonprofits for almost a decade. They are a Salesforce MVP alumna, Vice-Chair of the Amplify Board of Directors, holds a Masters of Public Administration from NYU, and is an ordained Rev. Priestess in a Goddess Church in California. This entry was posted in and tagged DNP2018, net2, net2van on August 31, 2018 by admin. When your critical holiday fundraising campaign threatens to go off the rails what do you do? BC SPCA’s Shoni Field + Charly Jarrett share their story – and offer tips to help you recover when your best-laid plans fall apart…. We exist in an age of reconciliation, one in which an increasing number of Canadians are beginning to explore their role in meaningfully addressing historical and ongoing injustices and inequities. So where does one begin? And what will a sector in meaningful pursuit of reconciliation look and feel like? This entry was posted in and tagged dnp, net2, net2van on August 31, 2018 by admin. Lyda Salatian of Green Teams of Canada shares her story of moving from damp sign-up sheets to self-selve phone apps powered by Salesforce. How Do You Manage a Remote Team and Retain the Best Talent? The competition for talent continues to grow, and while some nonprofits only use dollars as their competitive advantage, savvy organizations are turning towards attraction and retention strategies that individuals really want: work autonomy, location-independence and mobility. But, it’s not as simple as unplugging. Learn the key elements (and debunk the myths) to creating a remote-friendly employee culture. Certified leadership + career coach and culture engagement strategist, Crystal works with new and seasoned leaders to develop engaged employee experiences. Scaling teams, developing leadership communication skills, mapping out professional development plans, and designing distributed and remote workplace solutions, are supported by her professional experiences in community building, marketing, sales, social media engagement, recruitment, distributed + localized team management. Crystal has had the opportunity to drive talent, culture, marketing and community strategies at over 30 technology-focused companies like Yelp, Chimp, Invoke and Spring. Crystal is a location independent business owner and when not working, can be found in her garden, surrounded by a family of ducks, hens and a goose named Veruca. Recorded at The Digital Nonprofit conference, June 11, 2018. Digital transformation sure sounds like fun… the same way bathroom renovations do. Then you start finding black mold and structural damage, and before you know it your place is stripped down to the studs and you’re booking a three-month stay in a Motel 6. Rob kicks off the afternoon with a bracing look at what we’ve let ourselves in for — as well as the surprising upsides of disruption. Rob Cottingham is Canada’s leading progressive speechwriter, presentation coach and leadership communications strategist. He’s the cofounder of Social Signal, the world’s oldest social media agency, where he worked closely with a wide range of nonprofits. Rob draws the Noise to Signal cartoon on life, work and business in an online world, and performs as a standup comic wherever there’s a stage and a mic. Trend or Fad? What do nonprofits need to do to stay current? 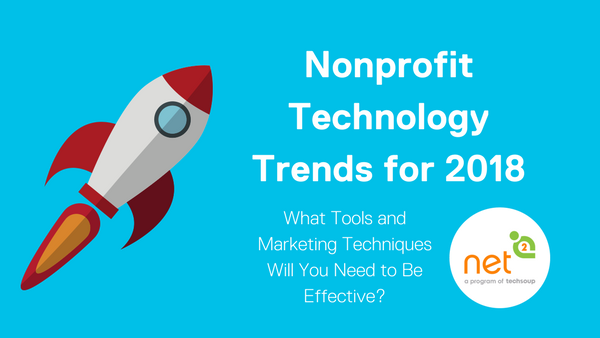 NetSquared Vancouver invited five local experts to share their predictions for the most important technology developments for nonprofits in 2018. Please join us in thanking our loyal sponsors, too. This entry was posted in Event report and tagged #NPtech, #Tech4Good, 2018, net2, net2van, nonprofit, trend on January 11, 2018 by admin.